Opposition, Muslim Brotherhood accuse al-Sisi of normalization with Israel after 2nd-largest state bank publishes rate. Egypt's second-largest state bank Banque Misr raised an uproar last week by publishing the exchange rate between the Israeli shekel and the Egyptian lira - in response to the heavy criticism, Egypt reminded that the shekel is still forbidden for use in commerce inside the country. An outpouring of Egyptians criticized what they viewed as a step towards normalization with the Jewish state. Despite the 1979 peace treaty Egypt remains openly hostile towards Israel, as was displayed earlier this month when 467 out of the 595 Egyptian MPs voted to dismiss MP Tawfik Okasha for the "crime" of meeting with Israel's ambassador to Egypt. The publication of the shekel exchange rate was condemned on websites identified with the Egyptian opposition and the Muslim Brotherhood. "The military regime is flying a test balloon before the Egyptian public for normalization with the enemy. (President Abdel Fattah) al-Sisi found a magic solution to escape the dark tunnels of economic failure through the Zionist gate," accused a site associated with the Brotherhood. Other backlash noted how just days after the exchange rate publication, al-Sisi asked each Egyptian with a cell phone to donate one lira to the state every morning, so as to help rescue the country from its poor economic situation. "Donate a shekel to Egypt every morning," reads a tag that has been popping up on Egyptian social media ever since, in a paraphrase of al-Sisi's appeal. Images have also been spread superimposing al-Sisi's face on an Israeli coin. The Muslim Brotherhood on its site noted that the publication of the exchange rate comes despite the fact that Egypt's Central Bank banned the use of the "occupation's currency" in banks in Egypt. 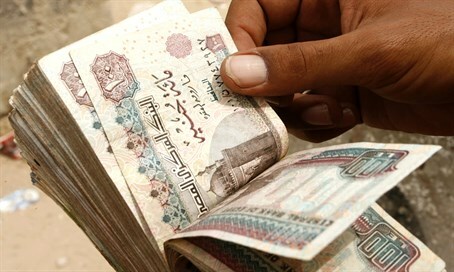 Zaki al-Ranimi, a spokesperson for Egypt's Central Bank, said in response to the uproar that the shekel does indeed remain forbidden for commercial use in Egypt, and that there is a supervisory committee enforcing the ban on Egyptian banks. The exchange rate was only published because the currency is traded in banks worldwide, said al-Ranimi. He added that al-Sisi had no connection to the publication. Despite the response of the Central Bank, some economists have estimated that the publication of the exchange rate stems from quiet understandings reached between Israel and al-Sisi's government on easing matters for Israeli tourists.